Comforting Instrumentals For Worship & Meditation, bringing the peaceful harmonies of Heaven to the hearts of listeners. Born out of the fiery furnace of affliction, the Lord gave me this poem and music to encourage me in my suffering. No one knows who wrote the psalm. Its shadow imagery suggests the author was Moses, who saw God as a great protective shadow fortress covering him and his people, protecting them from the hot desert sun as they wandered through the wilderness for forty years on their way to God's Promised Land. In the material world, a shadow is a reflection of something physical~ something tangible is on the other side of that shadow. The psalmist is using the metaphor of a shadow shelter to speak of the protection and comfort he finds in dwelling beneath God's shadow, the reflection of the spiritual reality that exists all around us beyond our physical powers of perception in our material world. That spiritual Reality is our Creator. How do we know these things about God? We know them through His shadow, or the revelation of Himself, which is His word. And the promises in His word form the Shadow Shelter of God. During my illness I treasured God’s word. As we abide by faith in God’s promises, we begin to know the Creator Himself who dwells beyond the reach of our physical senses. Faith is formed in one’s heart by abiding in God's Shadow Shelter. By abiding in God's word we receive answers to our questions about "Who God is" and "What is He like?" 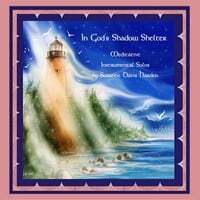 My album, "In God's Shadow Shelter" is a musical poem that the Lord gave me to comfort and encourage me during my illness. He wanted me to share this album with His people to comfort others who were also suffering and needed encouragement and assurance of His love for them. God's Power Is Very Great. As you listen to the music on this album, refer to the bible promises (*listed below) related to the songs and meditate on them and pray over them. As you abide in God's Shadow Shelter with Him, ask Him what He is speaking to your heart through this music, through these promises from His word and how He is going to use His promises in your life. God wants to bless us, to heal us, to guide us, and to meet our every need. May our Heavenly Father forever use this album to the great glory and honor of my Lord Jesus Christ who inspired it, and draw all who listen to it close into the shadow shelter of His heart and assure each precious soul of His measureless love for them, in Jesus name, amen. 2. Isaiah 54:10 (NLT) "For the mountains may move and the hills disappear, but even then my faithful love for you will remain. My covenant of blessing will never be broken,” says the Lord, who has mercy on you." 3. Matthew 10:30-31 (NLT) Jesus said, "And the very hairs on your head are all numbered. So don’t be afraid; you are more valuable to God than a whole flock of sparrows." 4. Psalm 91:10 (KJV) "There shall no evil befall thee, neither shall any plague come nigh thy dwelling." 5. Psalm 103:11 (KJV) "For as the heaven is high above the earth, so great is his mercy toward them that fear him." 6. Psalm 57:10 (KJV) "For thy mercy is great unto the heavens, and thy truth unto the clouds." 7. Psalm 136:7-9 (KJV) "To Him that made great lights: for His mercy endureth for ever: The sun to rule by day: for His mercy endureth for ever: The moon and stars to rule by night: for His mercy endureth for ever. 9. Psalm 44:23-26 Awake, why sleepest thou, O Lord? arise, cast us not off for ever. Wherefore hidest thou thy face, and forgettest our affliction and our oppression? For our soul is bowed down to the dust: our belly cleaveth unto the earth. Arise for our help, and redeem us for thy mercies' sake. 10. Psalm 40:17 (NKJV) "But I am poor and needy; Yet the Lord thinks upon me." 11. Psalm 30:5 (NKJV) "For His anger is but for a moment, His favor is for life; Weeping may endure for a night, But joy comes in the morning." 12. Psalm 30:11-12 (NKJV) "You have turned for me my mourning into dancing; You have put off my sackcloth and clothed me with gladness, To the end that my glory may sing praise to You and not be silent. O Lord my God, I will give thanks to You forever." 13. Genesis 9:12-13 (ERV) "And God said, “I will give you something to prove that I made this promise to you. It will continue forever to show that I have made an agreement with you and every living thing on earth. I am putting a rainbow in the clouds as proof of the agreement between me and the earth." 14. Romans 8:28 (NKJV) "And we know that all things work together for good to those who love God, to those who are the called according to His purpose." 15. Ephesians 1:19-20 (NLT) "I also pray that you will understand the incredible greatness of God’s power for us who believe him. This is the same mighty power that raised Christ from the dead and seated him in the place of honor at God’s right hand in the heavenly realms."